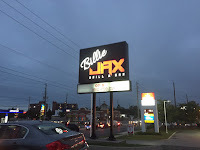 In the former location of Hooters, Billie Jax has transformed the location into an open concept, classier sports bar. When you walk in, you're almost in the kitchen! The kitchen has no walls and you can see all of the staff working diligently. There is a beautiful bar boasting a great variety of craft beer. They know how to get me! There are many TVs with different channels on, but you can see a screen from almost anywhere. 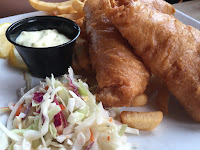 The menu is not your typical bar menu, it's a gastropub, but they couldn't leave off the pub classics, like fish and chips! Their burgers are fantastic. 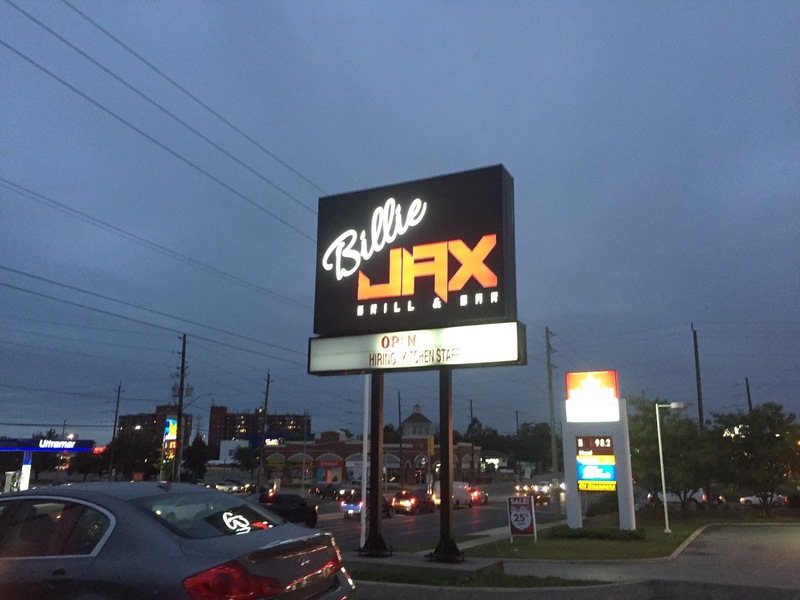 I tried the Billie Jax burger and the West Coast burger, both super awesome. 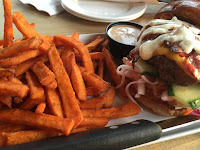 Regular and sweet potato fries are also quite good. Burgers are served on a brioche bun, so you're not overwhelmed by a ton of bread. I've also tried their Butternut Squash Ravioli with Jumbo Shrimp and it was fantastic. I would definitely get that again! The dessert menu is small, but if you need something sweet, these will do it. We shared the Mocha Ice Cream Cake. A large piece came drizzled with caramel and chocolate and sprinkled with slivered almonds. Very mocha-y. Good stuff! Service on both my visits were pretty good. Impressed with the food and reasonable prices. I understand they're new, so the staff is also new, but, I'm sure they'll get into a good rhythm. Hostess on my first visit was probably new to hosting, but I'll let her sitting us by a giant party, where our server had trouble getting to us slide. I was a hostess before, I totally get it. They've had a strong start! I look forward to future visits! Keep the good brews coming!